The Wenlock seems to divide people – you either love it or hate it. Well I love it. It’s a defiantly old-wave pub with a locals feel, and it’s buried in the streets north of City Road about half a mile from Old Street tube station. The Wenlock Arms has a reputation for good beer which means that it’s not just locals who take the trouble to search it out. I believe there are at least 8 hand pumps on the bar serving a varied and ever-changing selection of real ales – and they are always in top condition. The central bar at the Wenlock is surrounded on all sides by seating areas – there’s usually somewhere to sit. The atmosphere is friendly and welcoming. Food, when available, is basic but the doorstep sandwiches are certainly worth considering and the food is very reasonably priced. 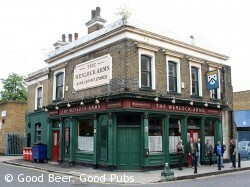 The Wenlock has recently been the subject of a campaign to save it from developers. The plan was to demolish the pub as part of the redevelopment of the area. Fortunately the appeals to Hackney Council were successful, and planning permission was granted to refurbish the pub and build flats above it. The work on the flats is not finished yet but the pub reopened in June 2013 and whilst the interior is cleaner, the character of the pub has been maintained. On my last visit in July 2013, the upper floors were encased in scaffolding. This pub is definitely worth finding if you like good real ales, and appreciate an old boozer type pub.